What inspired you to move to NYC from Minneapolis in 1976? Minneapolis, while a great place to grow up in and get an education, was just a starting line. I can't say that I was inspired to move here more like gravitated or pulled. I grew up listening to the likes of Dylan and the Velvets. I followed Warhol and loved the whole POP art movement -- it was just so America. I had an uncle living here who was an art dealer and I would come to NYC to visit periodically in the mid to late 1960's. He was the director of the Betty Parsons Gallery and he encouraged me to pursue my artistic interests. He introduced me to Max's Kansas City and got me into the Factory where I was actually was given a silver coke bottle. (I lost it). I grew up in the whole "hippie" period but never really related to the earth child "go west with a flower in your hair" stuff. There was always something deeper darker and more alluring about New York that appealed to me. It was on one of these NY visits that I stumbled on an ad in the Village Voice for a Bowery Loft, so I slapped down some key money and decided to move here in 1975 to pursue my artist career. Finding the space at 98 Bowery was one of the luckiest events of my life. Through the years it has been a home or stopping place for an array of artists in all fields. I quickly fell in with Marc Miller and Bettie Ringma, my upstairs neighbors who at the time were combing the streets and clubs photographing a lot of New York celebs. One of those clubs was CBGBs. I would hang with them on their nights out and that would eventually lead to the three of us collaborating together. One of such collaborations was a portrait of Bettie and the Ramones at CBs. 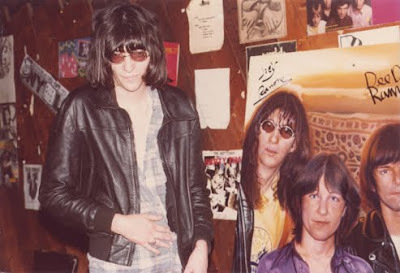 The painting was autographed by the Ramones and exhibited at the Washington Project for the Arts in what was billed at the time "Punk Art"
Where do you find your inspiration today? Why I paint what I do stems simply from what I am interested in or how I am feeling at any given time. I always say I paint where I am. That includes my thoughts or where my head is at. What's weird is that inspiration usually comes when I feel a total void and a lack of any interest in anything. I can't live with boredom for very long. I am like a child with a new toy when it comes to my work. When I first get it I love it to death but after a few years need a new toy or fix. My attention span is about 5-7 years with any subject. I like to move on when I feel I have covered the subject and I think it has becomes a formula which tends to cheapen it. There is always a new visual adventure out there waiting to be discovered. We (me and my fellow LES/EV bloggers) spend a lot of time writing about change in the neighborhood. Instead of focusing on what's no longer here... what do you think has remained a constant in the neighborhood through the years? What makes you feel as if it may be the same place as, say, 30 years ago? For starters, the residents. In a lot of ways the Bowery is pretty much the same. The Bowery is a street. But it’s the gang that lives here that makes it it what it is. You’d be surprised at how many of the stores have not changed or are just updated versions of stores that have always been here. What is happening now is that advertising has begun tapping into the myth of the Bowery. The Bowery and LES always had bars, on my block alone there were two -- Harry's and Al's. They're gone but have been replaced by newer establishments and different clientele. There were drunks then and there are drunks now. What's changed is that the smokers have to go outside causing noise. I can’t imagine Harry or Al saying to Jimmy and Jerry, "fellas you can't smoke in here," as they drank White Rose or Night Train. CBs is gone but it was never the Bowery it was CBs on the Bowery. CBs became a caricature of itself after 1982. Most of my neighbors still live here and the neighbors are what make the neighborhood. While some of the artists have left as in my building others have taken their place. Marc and Bettie left a long time ago and Maya Lin moved in and then moved on. Now a couple of talented gals, Brooke Arnao, a filmmaker, and Elisabeth Bernstein, a photographer, are living and working there. 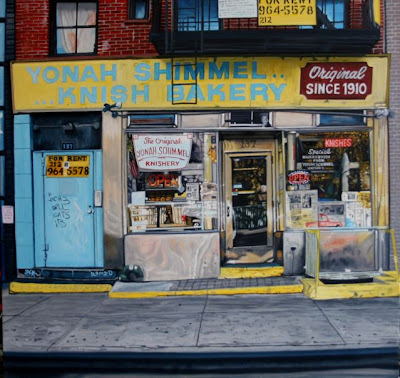 Elisabeth is currently exhibiting at The Wild Project on East 3rd Street with a show titled "Scapes." So in many ways the Bowery is the same. Maybe my building is an exception. The city has become way over priced making it difficult for young artists to move in early in their careers and with rents constantly going up it’s almost impossible to create a lasting community. Thankfully, many of the folks fought the good fight years ago when they converted these illegal spaces to legal living. But artists all over the world will find a skid row to live and work in until it becomes fun and the masses will follow like they always do. It happened in the Village. It happened to St. Marks, Soho and Times Square all living off an old reputation that no longer exists but is kept alive somehow by the hucksters. Now what the developers are doing is a different story one I could rant about for hours. In "Photographs for Your Kitchen," you focus on Mr. Softee ice cream cones and Happy Face bags. Why did you decide to explore these NYC motifs? 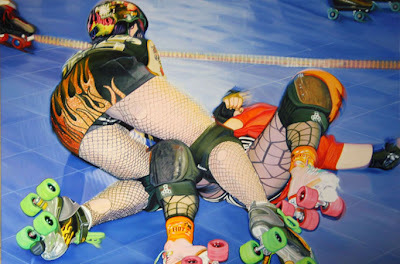 I finished a series of paintings last year, portraits of the Gotham Girls Roller Derby and local Burlesque performers. And after three years of work on the series combined with the sinking economy and hoopla around the Elections I was exhausted. I was suffering sort of a Postpartum thing. One Sunday last summer when returning from a visit to Coney Island my wife Ruth felt like having a Mr. Softee. Well, BINGO! 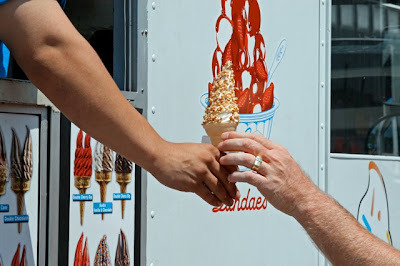 When that arm appeared out of that truck holding that cone and it's big swirl of cold Ice Cream, descending down to Ruth I saw "The Creation." Yup, the ceiling in the Sistine Chapel. So I decided to start hanging out by the trucks and photographing this everyday summertime event. I discovered a treasure trove of humanity around it. I would watch a grown adult turn into an eager child as they awaited their cone. For a brief time the area around that Softee window turned into heaven on earth. I carry a camera everywhere I go -- like when I’m walking my dog Dorothy. 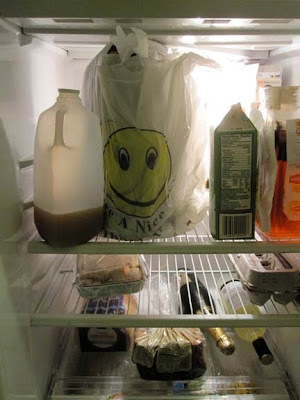 I started shooting smiley bags. They are sort of local residents too. I discovered that no matter what their circumstances they are always smiling at me wishing me a nice day and saying thank you. Tossed in the garbage, or squashed under a car tire stretched over a bicycle seat they always make the best of a bad situation. They make me laugh and deserve some attention. So I wanted to exhibit something uplifting and fun. 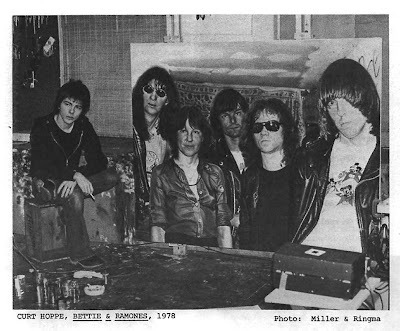 My best memory about the Ramones has got to be when they signed the painting Bettie and the Ramones back in 1978. You can’t imagine the thrill of carrying that big 4’ x 6’ painting down the Bowery and getting the Ramones to specially come over to CBs in the afternoon just to sign it. Tommy was still in the group. They all just stood there staring at it. I think Joey was the only one who really got it. Dee Dee was all hyper and kept asking their manager Danny Fields if it was OK to sign it. Then Johnny asked, "Who's Bettie?" I replied, "She's every Fan." When we carried that autographed painting back to 98, Marc, Bettie and I were just flying. I love the Ramones. beautiful, amazing paintings. and great interview, G! Great interview I look forward to seeing the art works. Thanks everyone... and thanks to Curt for doing the interview.